Infuse your favorite food with the smoky flavor of these natural wood grilling wraps. 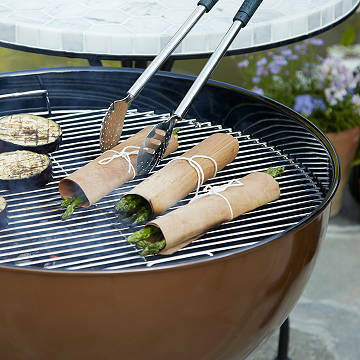 On the grill or in the oven, these natural wood wraps infuse your favorite food with smoky flavor from Pacific cedar and alder. Made by a family-owned business that sources materials to meet the highest standards of purity, the sheets keep food juicy as they impart their naturally savory notes, and also offer unique presentation for plating. Food-safe and free of unwanted additives. Nothing could be more evocative of the Pacific Northwest than the fragrant smoke of cedar. The aromatic, full-bodied flavor pairs wonderfully with soft cheeses with a rind, mushrooms, tofu, and vegetables. Another Pacific Northwest favorite, alder offers delicate, earthy flavor and a hint of sweetness. Its subtle, all-purpose smokiness pairs especially well with vegetables and fruit. Each set of eight wraps includes a roll of twine to tie bundles securely for cooking. Made in Sandpoint, Idaho. Click here to learn how to use your Grilling Wraps to make delicious vegetables. Soak wraps in warm water for 5-10 minutes before use. Wraps can be used on your grill or in your oven. Dispose of after use. Each set includes 8 grilling wraps. I am reviewing this product in the hopes of getting the advertised $1000 gift card. That said, it was a nice gift for my father in law who grills a lot. He didn't say anything about it one way or another yet. I don't think he's had a chance to use it. It improved the taste quality of the food! This was the perfect gift! Everything I purchased are Christmas gifts. Uncommon Gods, my favorite catalog!!!! I bought a couple extra of these wraps to wrap and keep on hand in case somebody pops on by during the holidays. I can rest of sure it's a gift that anybody can use. I know my friends and family can actually use them no matter what they're cooking skill level, as opposed to getting a gift for somebody that just collects dust. Amazing product! Very creative and delicious way to prepare veggies!!! My son loves to experiment while cooking. These wraps are quite the addition to his beautiful meals. I gave them to him early!